Earlier this season we got an exclusive inside look at the development of the new MBRP Performance Exhaust for the Patriot 850 engine. While the stock HP of the Polaris 850 is already pretty impressive the tuners at MBRP never cease to amaze us as they are always able to deliver performance gains while also creating that crisp & throaty MBRP sound we’ve come to love. The development of any new MBRP exhaust starts with benchmarking the stock exhaust on the Dyno. This is then followed by meticulously creating iterations which are Dyno and Flow Bench tested. The end goal for achieving performance gains for the Patriot 850 was to lower exhaust gas temperatures along with exhaust flow restriction while at the same time optimizing back pressure. The result was two exhaust versions; one targeted at Trail where legal decibel levels are enforced and other marketed as a Race exhaust. It’s important to note that the Race exhaust is meant to be used for racing, mountain riding or anywhere outside of where sound levels are enforced. Both exhausts yield significant weight reductions and moderate increases to horsepower. Build from 304 stainless steel and using a special ceramic coating for the in & outlet pipes the 6 inch diameter body Trail exhaust shaves 9 pounds off the stock exhaust while increasing power by 2HP. 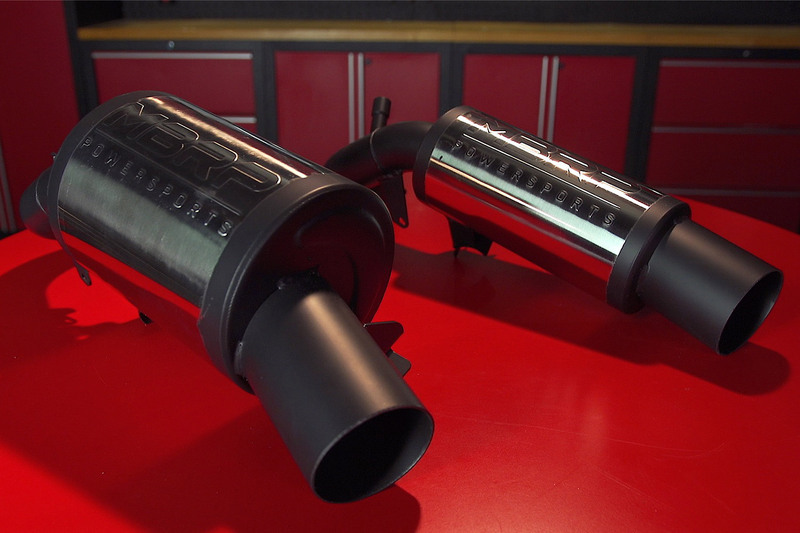 Built using the same 304 stainless steel and ceramic coating technology the Race exhaust has a slim body that measures 4 inch in diameter resulting in 11 pounds of weight savings off the stock exhaust while increasing HP an extra 3 ponies. Looking closer at the fitment, both the Trail and Race designs have laser cut brackets which guarantee a bolt-on and go design and the top bracket has been repositioned to increase its strength for those riders that tend to push the limits. Neither the trail or race exhaust require any remapping or reprogramming making these true bolt on designs. Aside from the impressive weight savings our testing of the exhausts on the snow delivered noticeable improvements to throttle response and acceleration. For the Trail exhaust, the free flowing HP seemed endless as the speedo arced its way past the C-note and power delivery out of the corners was instantaneous and strong. The enhanced sound being emitted from the exhaust was characteristically 100% MBRP. Throaty at idle with a crisp punch when you snap the throttle. We will admit; a loader exhaust does take a bit of getting used to when running at a constant speed, but the sound level and frequency of the MBRP exhaust does produce one of the cleanest sounding exhaust notes we’ve tested so far. Both the Trail and Race exhausts come with a 2-year warranty and are available for purchase through the MBRP website or authorized dealer. As a final note, regardless if you’re running a trail legal aftermarket or a stock exhaust, it’s important to maintain and exercise proper etiquette and stay off the throttle when passing through towns and communities. The purpose of an aftermarket exhaust is to increase performance and not to boast your ego.